Was wondering if anyone has ever frozen cucumbers? I have 12 to 15 on our first harvest and was looking for some way to preserve them for later. There are two varieties, straight 8 and sweet yet hybrid, both slicing variety. I read about freezing the slices for water but am more interested in freezing for storage. I expect they will be ruined by freezing them as they are mostly water. The only way to save would be to pickle them as far as I know. Sacrifice one an put it on The freezer tonight an that it out in the morning, an you will know if it is worthwhile. I suspect a frozen cucumber will end up as mush. My cucumbers (in Ga) are also doing well and I'm about to try fermenting some kosher dill pickles with them. Can you pickle slicing cucumbers? Don't let them get to big, but a cuke is a cuke. What type of pickles do you like? 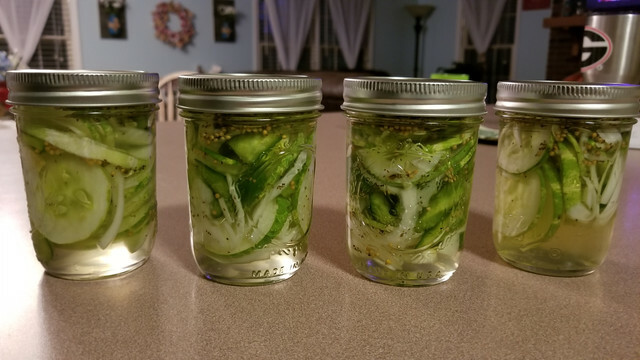 I make a simple refrigerator pickle that is quick an easy, an very versatile as you can add any veggie into the brine like peppers, onions, garlic ,carrots along with your cukes, an it is a good potluck dish. Some people like the bigger cukes but the seeds start to get big too, so smaller size makes for better pickles. Hillbilly Gardener, amongst many other things. GC...Oh yeah you can pickle slicers I do it all the time. Its all in how you slice them. You can make spears or slices but if canning them up remember you will get more spears in a jar than slices. Lots of great recipes for pickling out there... I make sweet and hot pickles with peppers and onion. I do Garlic Dills, relishes dill sweet and hot. You can do all kinds of things with slicers. In the Mountains of Old Virginia. https://www.allrecipes.com/recipe/22653/homemade-refrigerator-pickles/ this is an easy recipe but you have to keep them in the fridge. Like I said in this thread you can go a little crazy an put just about any other hard vegetable in with the cukes that you like as this is a basic recipe. If you want bread an butter pickles add some pickling spice too, or dill weed if you want dill pickles. This is a crowd pleaser recipe. Great Gopher thank you for the recipe, I just didn't want my cucumbers to go to waste. Think I'll try this, this weekend. I made the recipe I posted above tonight. Should know how they taste in 4-10 days. Considering how warm it is, I suspect it'll be closer to 5-7. Has water, salt, cucumbers, jalapenos, garlic, dill, and muscadine leaves. Each of those jars is 1/2 gallon. What does the muscadine leaves do? I think I will try to make chips by sprinkling Mrs Dash's seasoning over them before I put them in the dehydrator. I will update you on my results. adrianrog I have been looking into fermenting I am not set up for it right now but it might be something I would try down the road Please let us know how they turn out. Double B Would grape leaves do the same thing and keep them crisp? https://www.browneyedbaker.com/bread-and-butter-pickles/ this poped up on my FB page this am, an it has a short video, but it is similar to the fridge pickles above only bread an butter pickles. Adrianrog did you try them? The recipes always say to wait, but I suffer mightly from being a boomer baby so I can not wait. They do get a tiny little bit better, but you can eat them right now! Maggie I would think with all of the water removed, you will have very little left, but it sounds good. Keep us posted. I am unsure whether they would be crisp that way. I have never heard anyone using them in that application. Grape leaves have been used for many years in pickling for this very purpose but folks also use "pickle crisp" made by Ball (same folks that make the jars" and folks also use alum for the same results. If you haven't bought fermentation vessels yet then check these out. I ran across these fermentation containers, the prices are reasonable for large sizes compared to crocks and lighter. I tasted the brine last night, it was about as salty as ocean water. I put them in the basement last night, and didn't think to look at them before I left today to see if they'd started fermenting. I'll check on them when I get home from work. Thanks for the recipe ideas everyone, tried the refrigerator pickles last night and they turned out great!!!! Good on you GeorgiaClay! You can start eating them any time now. Adrianrog I am sorry for my mistake, as I thought had made the refrigerator pickles, which can be eaten right away, but you had started a batch of fermented pickles, oppsy! I have never made fermented pickles, so i hope they turn out great.